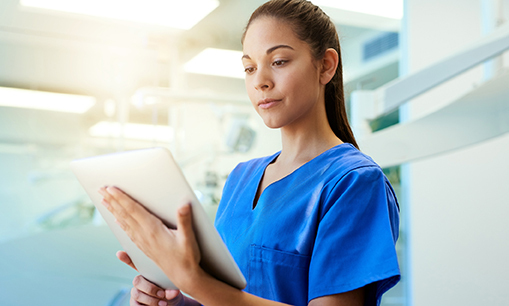 Healthcare organisations are moving towards a digital future at different speeds, with many nurses contributing to and leading digital innovation in their workplaces. Strong leadership is vital in making digital innovation in healthcare a success, with effective leadership at board level essential to maintaining patient safety through data security. Strong board leadership is also required for securing funding; digital systems will invariably have hidden costs, and maintenance and support needs must be factored in and managed from the start. Introducing a digital system is not one person’s crusade, it is an interprofessional team effort. Engaging with staff, patients, the public and collaborative partners, where possible, is equally important to success – if we don’t learn to share the responsibility, we risk repeating mistakes and wasting money. Positive attitudes towards technology are key to engagement. Healthcare is full of comments like, ‘Oh, we had that system, but no one liked it so it isn’t used now’. This can undermine engagement with a new system, so beware of falling into the bear pit of negativity. Standardising paperwork and systems as much as possible will help the transition to digital run more smoothly, and you need to make sure you have the right kit. Hardware and software, as well as all the relevant interfaces, are firmly in the domain of the technology department, who can help you choose the best equipment to ensure systems work well together. For digital innovation to be a success, you need to invest in your staff by providing time for training. By educating staff, patients and the public, everyone will start to own, tweak and contribute to the digital roll-out. Start by ensuring that all staff understand information governance, data security and protection. Create an in-house team of experts – these roles often have titles like ‘super-user’ or ‘floorwalker’ – and build in safe simulation. Most people learn by using the system. Online self-assessment staff surveys will give you feedback, and interactive workshops will help everyone to become familiar with the system. Use paper and online communication methods, including newsletters and noticeboards, to get the message across.